Why is the number of components of Lie group finite? The following quote is from An Introduction to Lie Group and Lie Algebra by Alexander Kirillov. By "discrete" he means that $|G/G^0|$ is finite. However, according to Introduction to Smooth Manifolds by J. Lee, a topological manifold has countable (not finite in general) components. So, I'd like to know what condition makes lie group to have a finite components. Browse other questions tagged general-topology lie-groups or ask your own question. Is there an infinite dimensional Lie group associated to the Lie algebra of all vector fields on a manifold? 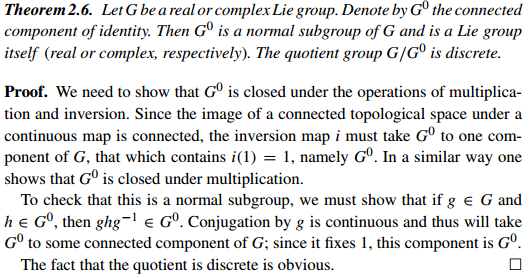 Immersed subgroup of a Lie group is a Lie group? What is the dimension of $M/G$ if it is a manifold? Easily visualizable examples of Lie groupoids? Why is not possible to show that $S^7$ is a Lie Group in the following way?